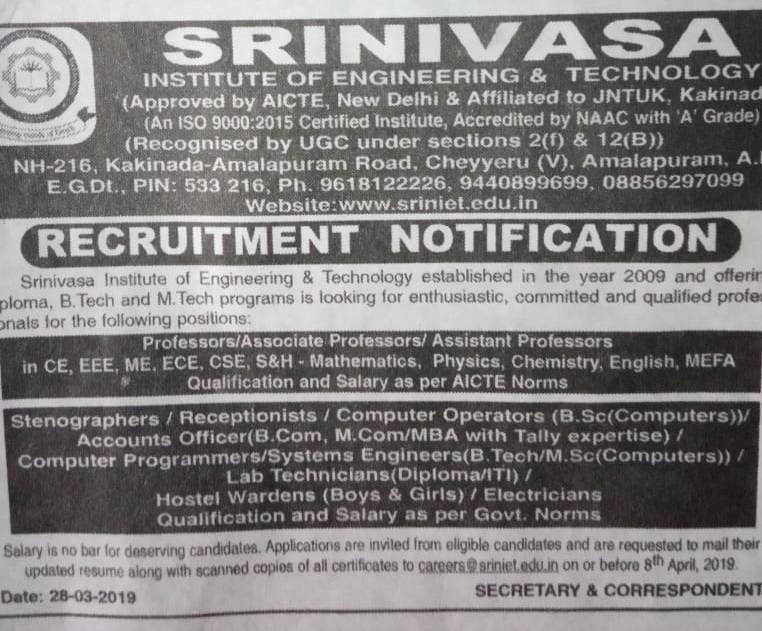 candidates can send the Updated Resume with all Educational Certificates copies to College Email-id Address are given below for Srinivasa Institute of Engineering & Technology Posts.For these jobs can apply from 30-03-2019 to 12-04-2019. Further details can refer the official website www.sriniet.edu.in for Srinivasa Institute of Engineering & Technology Jobs. Available vacancy, Salary, Important dates, Selection Process, Application Procedure, Qualification are given below. 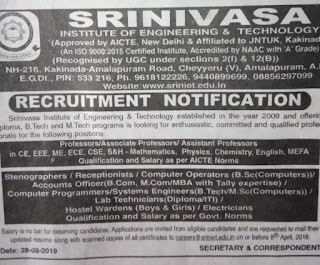 Srinivasa Institute of Engineering & Technology. Starting Date to apply for Professor/Associate Professor/Assistant Professor/ Non-Teaching Staff Jobs: 30-03-2019. Ending Date to apply for Professor/Associate Professor/Assistant Professor/ Non-Teaching Staff Jobs: 08-04-2019. For computer Operators Required Qualification is B.Sc Computers. For Account Officers Required Qualification is B.Com/M.Com/MBA with Tally expertise. For System Engineers and Computer Programmers Required Qualification is B.Tech/M.Sc Computers. For Lab Technicians Required Qualification is Diploma/ITI. Eligible candidates can send the Updated Resume with all Educational Certificates copies to College Email-id Address are given below. Last date is 08-04-2019.